Holds coats, shoes and even hats. Project swivels on a Lazy Susan bearing to allow easy access to all sides. The top is adorned with a pineapple - a symbol of hospitality. Accepts four coat hooks. Shoe rack holds eight pairs of shoes. Hats can rest on pineapple leaves. All patterns drawn FULL SIZE. Measures 60"H x 14" dia. 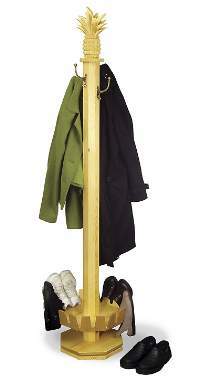 Order #1354 Wardrobe Hooks, #9C Lazy Susan Bearing and two pieces of #9560 1/4" x 12" x 12" Birch plywood separately.